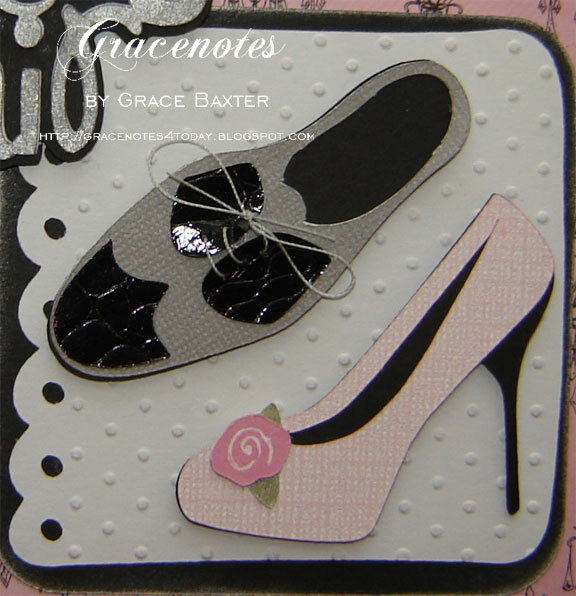 This card began with the making of two shoes which I made several months before deciding what to do with them. There is a lot of detail in these shoes so I am glad I had the foresight to make them up ahead of time. The occasion is an anniversary. I had in mind to do something especially elegant. My imagination came up with an entire story when I remembered how this couple used to love dancing. I pictured them in a gorgeous ball room where there were many lovely chandeliers hanging. That's where my chandelier paper comes in. For the gentleman's shoe, I used special "patent leather" paper that looks like snakeskin. Paired up with gray, I think it looks smashing! For the laces, I used nylon thread and literally sewed it through the tiny holes. This took longer than expected as I added the laces after the shoe was constructed. The woman's shoe on the Sweethearts cartridge is kind of skimpy and not really stylish. I love this high heel from the Forever Young cartridge. I selected a textured CS that gives the shoe a linen look. The tiny rose leaves are pearlized (though the pic doesn't show it well). The shoes are adhered to the frame using dimensionals. For the white embossed panel behind the shoes, I went on a search through my Gypsy to find something pretty enough with simple edges. 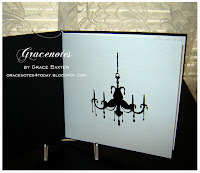 Gypsy Wanderings had this cute scalloped frame which looked great when embossed with dotted swiss. The black shadow piece is from George. 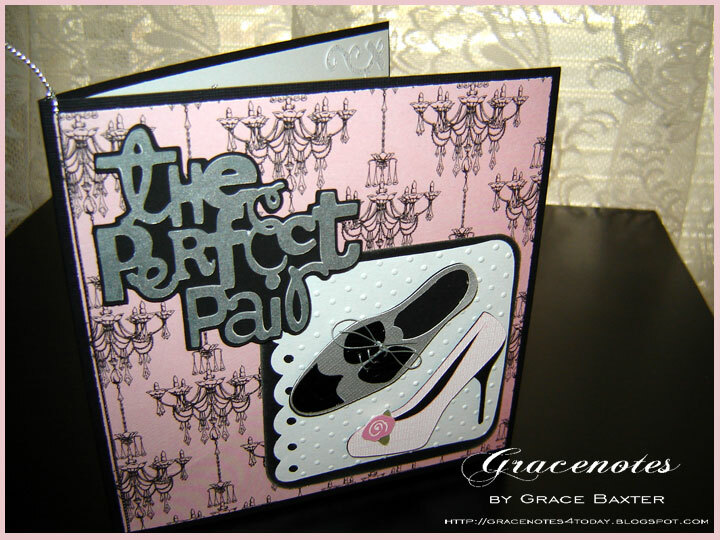 "The Perfect Pair" is cut at size 2-1/2 from white and gray, layered. To give it some shine I sponged silver ink over top. The sentiment is layered in black and stuck to the card using pop dots. 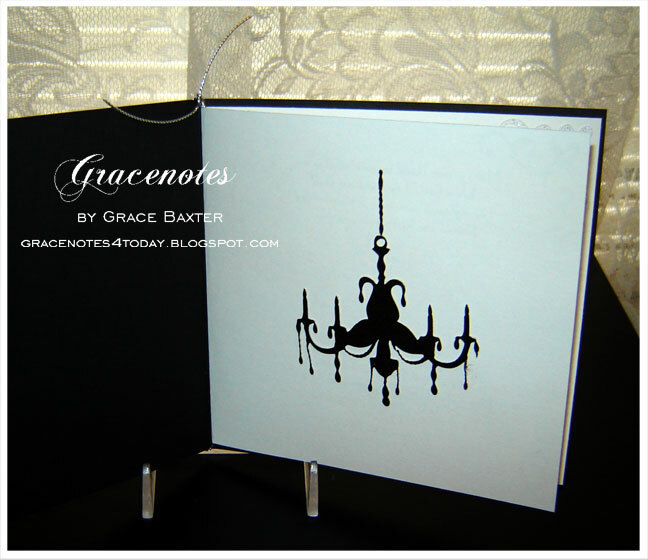 The inside first page mirrors the chandelier background on the front. This was tricky to cut as the lines are so fragile they kept breaking. I finally went with a "shadowed" cut. When you turn the page there are two Bible verses that suit a husband and wife perfectly. On the right-hand inside panel I wrote a personalized message to the couple. 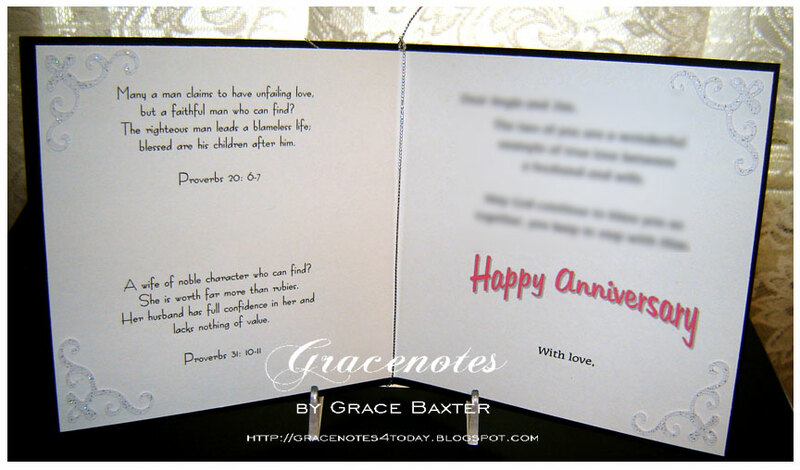 I prepared all the text on my computer, creating the "Happy Anniversary" in Word Art. For the sparkly corner scrolls, I used some corners cut from the Christmas Cards cartridge. A full list of carts used is below. Sweethearts, Forever Young, George and Basic Shapes, Home Décor, Gypsy Wanderings, Christmas Cards. 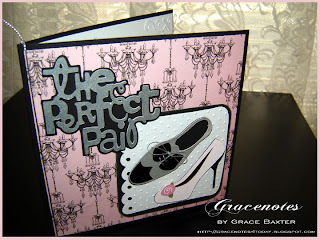 Beautiful and elegant card! Love those shoes.